Great News! 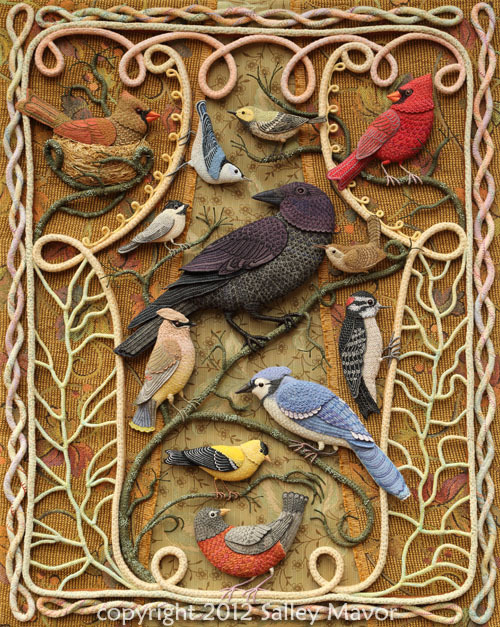 I just found out that Birds of Beebe Woods will be part of the international exhibit, Fantastic Fibers 2013 at the Yeiser Art Center in Paducah, Kentucky this spring. The exhibit will be April 6 – May 4, 2013. I’m pleased that my fabric relief piece will be shown along with other contemporary and innovative works created with fiber as the primary medium. The American Quilter’s Society Annual Show and Contest will be held in Paducah from April 24th-27th, 2013, so I’m hoping that many of the quilters in town will go to the Yeiser Art Center and see the Fantastic Fibers show as well. Birds will have to be sent down to Kentucky soon, so Rob is going to whip up a shipping crate right away! Won’t be in Paducah to see the real piece this spring? Here’s the next best thing — I have 2 different note cards and a poster of Birds of Beebe Woods for sale in my Etsy Shop. 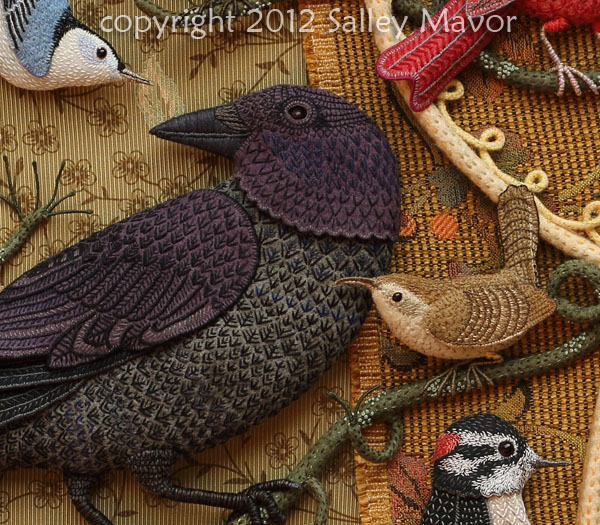 This entry was posted in Birds of Beebe Woods, Etsy Shop, Exhibits by Salley Mavor. Bookmark the permalink. I’m sure your Birds of Beebe Woods will wow the attendees. Yes, Paducah sounds like a happening place for the arts! So Happy for you Salley! It seems your Art, like children, also needs to spread it’s wings. Congratulations on this great honor…another one so well deserved. Just said to Bill that if we lived in/near Kentucky, we certainly would make the trip to visit The Birds of Beebe Woods. I wonder if you know where it will be permanently housed once it makes its visits around the country. I do plan and hope to see it at some point since it’s one of my favorite Salley Mavor masterpieces! I enjoyed reading Pam Fenner’s comments since I had no idea that Paducah has a rich and growing legacy of the arts, fabrics and stitchery. I think it sounds like an area I’d love to explore. Good wishes and happy creating! Thanks so much, Pam. I won’t be selling the piece for a while yet and plan to enter ‘Birds” in other shows, so that it can be seen by the public as much as possible. I hope some day I will be able to see it maybe in San Francisco. So beautiful. Congrats On having your wonderfull birds resting in Kentucky for a showing . That piece is so superb in so many ways .I am in love with it .I wonder if you might consider having a poster made of it .. I am sure many folk beyond the fabric world would give a few eye teeth to own one .I would . I am happy to get the chance to tell you that I have been an extatic fan of yours ever since you taught us at the Textile Tarts Meeting @ the Westford Ma library . I have been blown away at your exhibits .There have been many happy little people gifts , form here , doing lots of fun things , who owe there lives to your inspiration . I wish you continued joy in your creations . Congratulations, Salley! I’m sure quilters will love to see your work at Paducah. I haven’t been yet, but many of my quilting buddies have. It’s a big deal. I look at some of these birds here in my woods. You captured so many details in your stitching. So incredibly wonderful! I just love it! Thank you for your art! I’m so glad this will be exhibited during the quilt show. I will definately go see it, and I’m planning on stopping in Mt. Vernon on the way down to the show too. So many things to look forward to. That’s great Donna. I’m glad that these shows will be in your “path”! Thank you for this news, Salley. Paducah is only 1 1/2 H from Mt Vernon, IL, so I can take both exhibits in on one trip! This will be very exciting!!! Great, Carol! And thanks for the mid-western geography lesson. I’m a great fan of your birds, so I’m very happy for your exibition i Paducah. I’m an Italian quilter and I like to know if I can learn making your bird on one of your books. Is there any of the kind? Thank you for your interest in my work, Simonetta. Sorry, but I have no plans to write out directions and patterns for my artwork, with the exception of the dolls and projects in my book Felt Wee Folk.